In Florist, Emily Sprague and fellow Catskills friends sing quiet, delicate songs filled with vivid memories. “Vacation” is about growing up and learning about love. “Cool And Refreshing” finds Sprague singing about the childhood memories that we lose one by one. 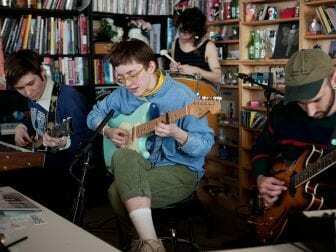 Tiny Desk Concert with Florist. These two songs are from Florist’s 2015 EP, Holdly, while the band closes its Tiny Desk concert with “1914,” a track from its new debut full-length, The Birds Outside Sang. On drums, you’ll find a Tiny Desk alum in Felix Walworth, who was first here with Bellows, then Eskimeaux; all of these musicians are connected in some way to the Epoch, a collective from New York City. It’s a creative friendship with stories to share, and its members’ songs feel best in intimate settings, like a desk surrounded by old and new friends.